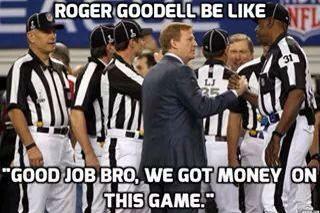 The NFL has always gone to great lengths to make sure that the public perception of its officials is above reproach. Yes, we may bray at the ways in which some referees bungle calls on Sundays (hello, Jeff Triplette), but as a general rule, the league has managed to avoid any obvious issues regarding corruption and bias in this regard. And in that regard, the league now has a major, major problem on its hands. In a video posted on TMZ.com, NFL VP of officiating Dean Blandino -- or someone that looks a lot like him -- is seen departing a party bus which seems to have been commandeered by Dallas Cowboys Executive Vice President Stephen Jones (son of team owner Jerry Jones). The bus was on the Sunset Strip, with FOX analyst Jay Glazer as a tour guide. I think I was saying it in the 3rd quarter... "This game is fixed."